If you just brought home a shelter dog for the first time, you’re probably wondering how you can make the transitional period go as smoothly as possible for both you and your new dog. One of the best things you can do for your dog is to be patient. Some dogs may adjust fairly quickly to the new situation, while others may take months before they finally relax and feel comfortable in your home. Understand that while you are training your dog, temporary backslides may happen. This is when it’s most important that you are patient, and give the shelter dog all the time it needs to adjust and learn. It’s a very real possibility that the dog you have adopted may have been left by someone they love or they were lost and unable to find their way home. Combining this with their time spent in the shelter could leave the dog with some emotional trauma. This could mean that it takes a while for them to feel safe and secure in your home and for them to warm up to you. Don’t try to rush them or push the dog too quickly, you must earn the trust of your new shelter dog. Your dog may also be coming from a home where they didn’t feel comfortable or safe, in which case you’re really going to have to give them even more time to adapt. Talk to the shelter to get as much information on the dog’s past as possible so that you can try to make this transitional time comfortable for them in any way you can. When you first bring your shelter dog home, they’re going to be very overwhelmed by their new surroundings. Don’t be alarmed if you notice that they are anxious or have a lack of appetite. They might even hide under furniture or stay in one particular room for a few days. Don’t try to rush them in their adjustment, but be sure to show them that you’re there for them. The best way to help integrate your new dog into your home and life is to give them a routine. This can do a lot to help lessen the dog’s anxiety, as they will adjust quicker when they know what to expect from each day. This should include things like feeding them in the same place and at the same time every day. Walking them on a schedule will also help so they know when to expect they can go to the bathroom. Taking the same route during these walks can be very helpful in allowing your dog to get oriented with the area and feel like they know where they are. It’s also a good idea to use the same words or phrasing when referring to it being time to walk or eat. This is so your dog can recognize what you’re telling them. Playing outside with your dog and taking them on walks are great ways to bond, but so is sitting with them and petting them gently. 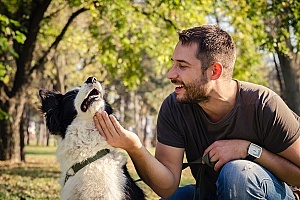 Touch is an extremely powerful form of communication, and taking the time to pet them gently can do a lot to show your dog that they are safe and loved. Talking to them in a soothing voice can help them get used to your voice and allow them to relax a little bit more. Shelter dogs might be more hesitant to make a connection with you because they’re scared you’re going to leave, so be patient with them if bonding takes a long time. Even if your dog has all the necessary vaccinations and you don’t suspect them to be ill, it’s still a good idea to take them to the vet for a checkup. This can help give you more insight into their personality and past history. How do they react at the vet’s office? What does the vet notice about their health? Be sure to ask lots of questions so you can get a better idea of how best to take care of your new family member. While you’re super excited to show off your new shelter dog to everybody, your dog is probably already going to be extremely overwhelmed. A good general rule of thumb is to introduce your dog to no more than one or two new people a day. This can also help to reduce some of their confusion about who’s going to be a permanent member in their life. You should also wait a few weeks before taking your dog to a dog park or other busy environment. Not only do you want to ease your dog into situations like those, but you also want to make sure that you’ve already established a strong bond with your dog so they can be comforted by your presence in these new places.